After an onslaught of criticism over a Little Bites Instagram ad, Spelling's husband jumped to the star's defense. A healthy lifestyle looks different on everyone, celebrity moms and kids included. But this week, Tori Spelling received a blitz of backlash online for a snack advertisement she posted on Instagram featuring her children. Spelling, 45, posted an ad to her page on Thursday featuring a picture of her kids having some Little Bites muffins. “This mom of 5 finds snack time a balancing act between pleasing my kiddos and feeling good as a parent about what I’m feeding them,” the “Beverly Hills, 90210” star wrote in her caption. The slideshow post included Spelling’s kids enjoying Little Bites strawberry yogurt, chocolate chip and blueberry muffins outside their California home. In addition to calling the muffins “kiddo approved,” Spelling praised the snack’s ingredients. Despite the busy mom’s lighthearted tone, the advertisement garnered attention from opinionated parents across the nation. “Empty calories with no nutritional value,” one follower wrote. And “Real fruit is healthy!” another added. Other outspoken critics skipped over the topic of nutrition and went straight to attacking Spelling’s children. 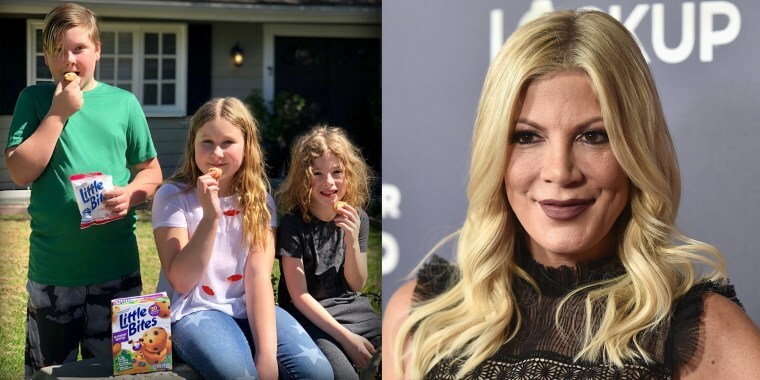 “Is it just me or is there a giant elephant in the room here ... I’m a huge fan of Tori Spelling, but are we really pretending her kids eat healthy,” one user wrote. “This is why 3 of your kids are overweight and unhealthy. What a shame. Try cooking,” another person wrote. The comments crossed the line for Dean McDermott, Spelling’s husband. He jumped to his wife and kids’ defense. “Hey everybody, I am sick and tired of everybody taking a shot at my wife, Tori Spelling. Just because she’s a celebrity they think they can say and do whatever they want,” McDermott said in a video shared to Instagram on Friday. “She posted about a snack, it’s a snack people. Haven’t we given our kids a snack before? Cakes, cookies whatever. It’s a snack. She’s a great mom. We’re great parents. Our kids eat healthy. They eat a lot of fruits and vegetables, and occasionally they have a snack,” he said. The American Heart Association suggests that kids eat less than 25 grams, or six teaspoons, of added sugar per day. One pouch of Little Bites Chocolate Muffins contains 17 grams of sugar, or about 3 and a half teaspoons. A pouch of Little Bites Blueberry Muffins contains 14 grams of sugar, or about 2.8 teaspoons of sugar. Amid the criticism and shaming, some fans came to Spelling’s defense. “Yay for easing snacking,” said one commenter. “If you want to get on social media & talk about a child’s weight or body, you really should get a life. Or a hobby. Bless your heart,” added another user.